Sogbety Diomande talks with the children about West African music, explaining the different types of instruments. Sogbety Diomande plays music as the children clap along with the beat. POMEROY — While the library is normally thought of as a quiet place, the Pomeroy Library was filled with music, clapping and dance on Thursday afternoon. 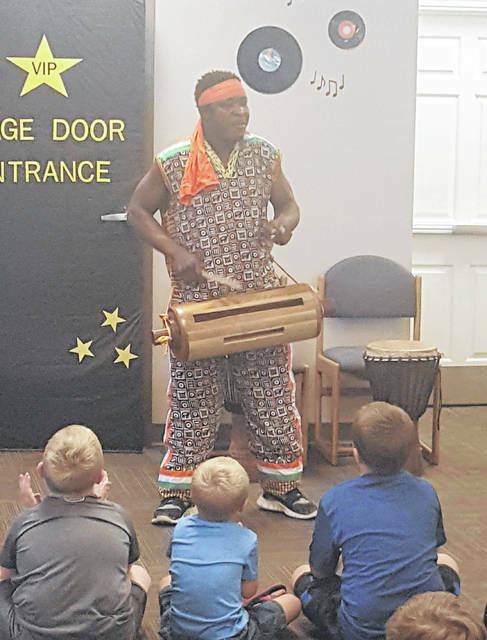 Dozens of children were on hand for the “Libraries Rock” children’s summer reading program presentation by Sogbety Diomande. In a high-energy performance, children experiences the rhythms, dances, and songs of West Africa by Diomande. Diomande also taught the children how to say “Hello” in his native language. According to a biography posted on the library event page, Diomande was born in the village of Toufinga, a small farming community located in the Northwest region of the Ivory Coast near the border of Guinea in Africa. He started his career as a drummer and dancer at a very early age. He has toured with Ballet National de Cote d’Ivoire; been a member of Kotchegna Dance Company, Mask Dance Company, and has been featured with many troupes in NYC and around the United States. Libraries Rock Summer Reading Program continues through July 20. Next week will feature the popular Nancy the Turtle Lady on July 3 with programs at 11 a.m. and 2 p.m.
On July 11 will be the Science ROCKS with the Ohio Valley Museum of Discovery at 2 p.m. The Shark Cart from the Newport Aquarium’s WAVE Foundation will be at the Pomeroy Library at 2 p.m. on July 17. 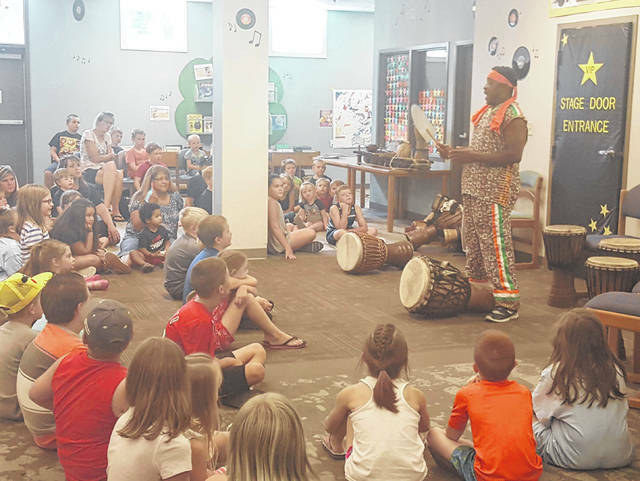 The wrap-up party for the Summer Reading Program will take place from 5-7 p.m. on July 19 at the Racine Library with water slides, a foam party and more. https://www.mydailysentinel.com/wp-content/uploads/sites/14/2018/06/web1_6.29-Library-1_ne201862816010258.jpgSogbety Diomande talks with the children about West African music, explaining the different types of instruments. https://www.mydailysentinel.com/wp-content/uploads/sites/14/2018/06/web1_6.29-Library-2_ne201862816014564.jpgSogbety Diomande plays music as the children clap along with the beat.